Discover a quintessential Kiwi holiday in Whare Puni. 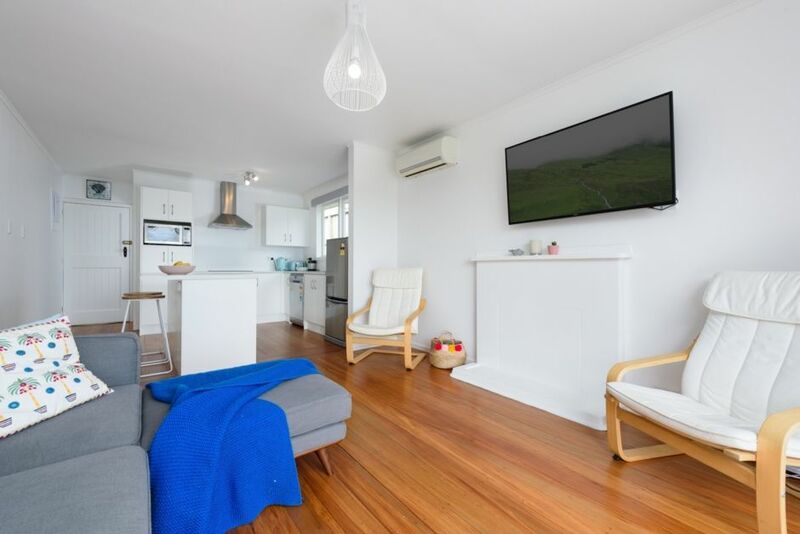 Lovingly redecorated this cute and cosy home is light and airy and only a short stroll from the beach and popular cafes. The spacious deck and front lawn is sure to please offering plenty of room for your cars and the boat if needed. Relax in the gorgeous outdoor bath tucked away around the back of the property at the end of the day. Redecorated and modernized the space is crisp and clean offering 2 bedrooms, a cosy lounge and kitchen. One bathroom has a bath and vanity while the other has a toilet, shower and washing machine. The deck is a great spot to enjoy the afternoon sun and overlooks the large fully fenced section. One small to medium sized dog allowed ON APPLICATION. Please give details when as to whether you are a family group or a group of friends and what the ages of your group are. There is a small drop off the deck so may not be suitable for toddlers. Guests use at own risk. Lovely property and home. We will definitely be back in the future. Perfect for a young family and although we didn’t bring our dog with us it would be a perfect place to bring one. A great little Bach in a wonderful location. Lots of land and not too overlooked. Modern kitchen with all the amenities. Could do with curtains in the living room for privacy at night and a few lamps in the bedrooms, but everything else was perfect.